I fly American a fair bit internationally, though a vast majority of it is on their Boeing 777-300ERs, which is their flagship plane. 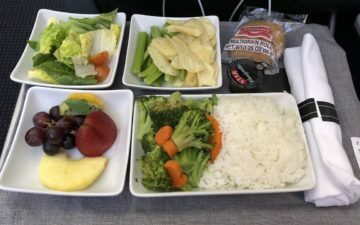 That’s because these planes feature reverse herringbone seats in business class, which is among my favorite type of business class hard product. It’s also because all of American’s 777-300ERs are configured in the same way, so there’s no chance of a last minute aircraft swap to the same plane with a different configuration. 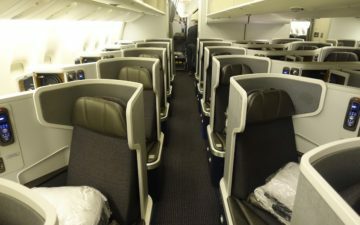 I’ve also flown American’s new 767 business class, as well as their old 767 business class, their A330 business class (on ex-US Airways planes), and their old 777-200ER first class. But up until yesterday I hadn’t flown American’s new 777-200ER and 787-8 business class product. 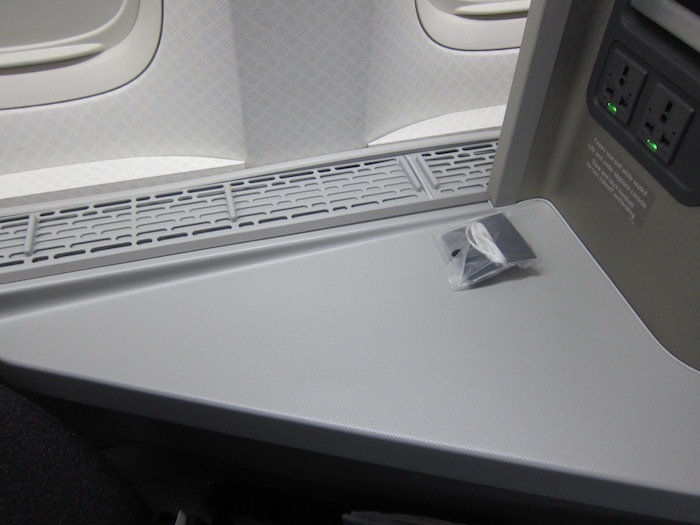 American first announced this product in April 2014, and it was yet another type of fully flat product with direct aisle access from every seat (as if they didn’t have enough already). They first introduced it on some of their 777-200ERs, and then on their newly delivered 787-8s. Why didn’t American just go with the same reverse herringbone product on these planes? Apparently because they were licensing it from Cathay Pacific (it’s the same business class product they have) exclusively for the 777-300ER, and it ended up being cheaper for them to just develop a new product altogether for their other planes. Unfortunately in September 2015 American announced they were suspending their 777 refurbishments, due to some issues with the seat manufacturer. American still hasn’t announced who will be taking over the contract, though it means American will have yet another type of business class seat. The lack of fleet commonality is mind-boggling. 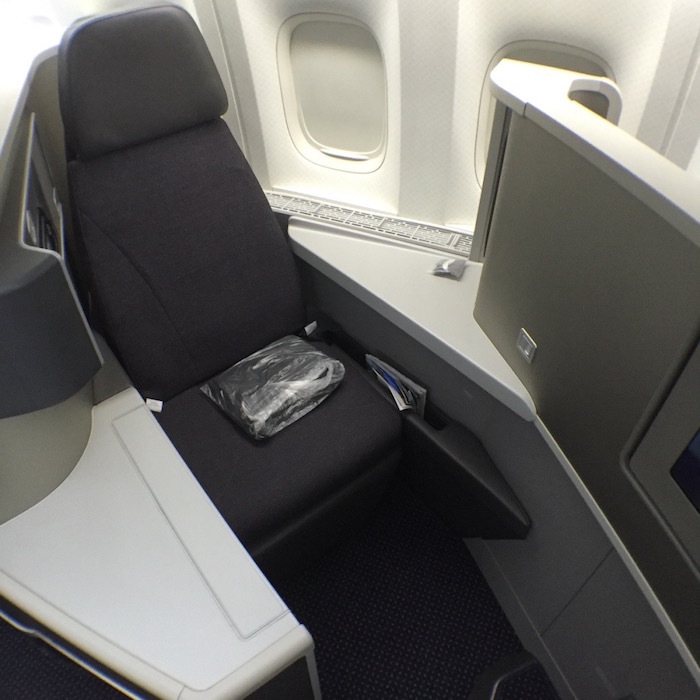 All that being said, yesterday I flew American’s new 777-200 business class product for the first time. It was just for a flight from Miami to New York, so I didn’t get to fully experience it. But I figured I’d still share my thoughts, with the promise that I’ll have a more in-depth review when I fly this product to China twice on the 787 over the next couple of months. 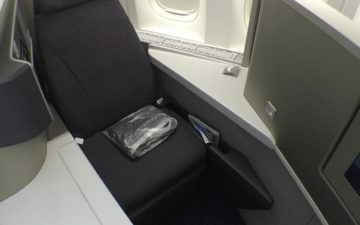 American’s refurbished 777-200s have a total of 45 business class seats — there are 21 seats in the forward cabin and 24 seats in the rear cabin. The seats alternate between being forward facing and rear facing. Much like with a reverse herringbone configuration, even the center seats are fairly private, so you’ll have to lean forward if you want to talk to the person seated next to you, as there’s a barrier between seats (and there’s also a partition you can raise if you’re traveling alone and in the center section). I assigned myself seat 4L, which is a rear facing business class seat. The rear facing business class seat was awesome, as it featured two large side tables. That has to be among the most side table square footage of any business class seat out there. Speaking of square footage, the tray table was massive. It came out easily though was also fairly inflexible, in the sense that you couldn’t slide it around as much as in other business class products. It basically had one position, and took up a lot of space. The forward facing seats are the same general design, though the major difference is that they only have one side table, on the window side. They open up to the aisle, so you just have a retractable armrest on the aisle side. One other thing worth noting is that the forward facing seats have a harness you have to wear during takeoff and landing, so you have to buckle up the same way you would in a car. The rear facing seats don’t have that, however. The seats all had ottomans, which were rather small. The good news is that there was no vertical barrier, so the area for your feet was less constrained than in a reverse herringbone configuration. To the side of the seat were two USB outlets and two 110v outlets, along with a small storage unit. I love that there are four outlets for charging electronics. Then on the opposite side of the seat are the entertainment controls, seat controls, and a reading light. I only briefly put the seat into the fully reclined position, though I couldn’t help but feel like the bed itself wasn’t very long. When I stretched out fully I took up the full length of the bed, while there are usually an extra few inches in a reverse herringbone configuration. One other good thing about the refurbished 777s is that they feature wifi. It’s also provided by T-Mobile, and the pricing is the same as on all of American’s longhaul flights. There are two other downsides to these seats I should note. First of all, the seats are connected in a rather annoying way. Due to the forward and rear facing nature of the seats, each set of two seats was one “unit.” That meant if the person seated in the seat in front or behind you (whichever is attached) got up or shook their seat in any way, you could feel it. This wasn’t a huge deal on a short flight, but on a long flight I could imagine it would get really annoying, especially if it wakes you up. Second of all, in a reverse herringbone seat you don’t really have to look at anyone. Because this configuration features a combination of forward and rear facing seats, you do sort of awkwardly look at the person seated across from you in the center section. It’s not problematic and you’re not staring at them directly, but I would feel like I’m being “watched” if I were in one of the center seats. 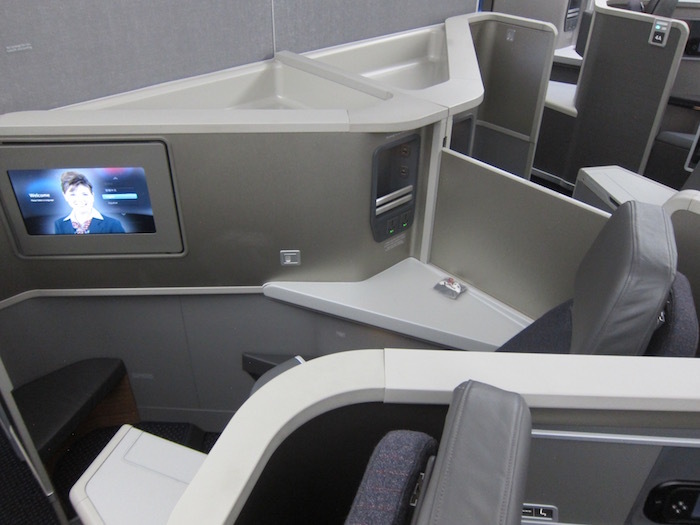 How does this compare to American’s 777-300ER reverse herringbone business class? That’s a toughie. I’d have to fly it on a longer flight to be sure, though I think I might prefer this product marginally, at least in a rear facing window seat. Why? So as of now I don’t have a strong preference for one product over the other, though overall I was impressed, as I had heard quite a few complaints about this type of seat. I liked it. 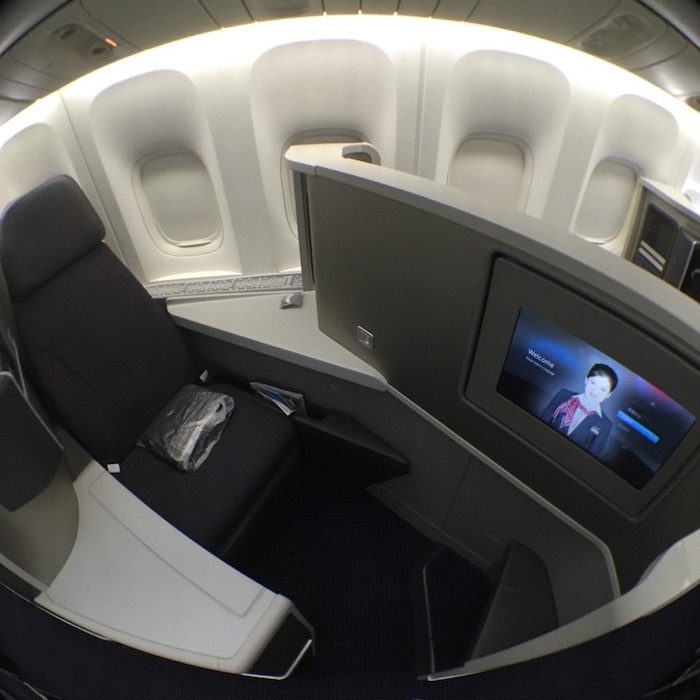 If you’ve flown American’s new 777-200 or 787-8 business class product, what did you think? Was that touch screen seat controller responsive and intuitive? that rear facing seat looks a bit narrow with both side tables. Does one of them move down so that you can have more shoulder room while in bed mode? Why does the ‘forward facing’ seat have a shoulder strap? No other plane has that. I can understand why it might be necessary on the ‘rear facing’ seat. Just curious. @ Jacob — I’m about 6′. Yes, the controller was responsive and easy to use. Curious to see how the 787 product differs! @ elteetrav — They don’t go down, so that is a consideration. Personally I don’t mind the width since at least my feet aren’t constrained — that’s when lack of width really starts to bother me. What is your sense about the ‘privacy’ of the forward facing window seats? Is it fair to assume you won’t be looking at anyone the way you described in the rear facing seat? I feel like I’d trade an extra table space for a collapsible armrest and privacy. @Kenny United 747 F has that. Ben, I flew on the inugral 787 for American Airlines and I agree I personally love flying backwards in this configuration. I can’t wait for your 787 business class review for American Airlines!! I am really excited for your review! What are the best seats to choose for a couple flying together? Is it better to take the forward-facing middle seats (which appear to “angle in” toward each other) or the rear-facing middle seats (which appear to “angle out”)? Or would you suggest taking two window seats in adjacent rows (e.g. 7A and 8A)? i flew this plane (777-200) back from London recently. Though seated in the “couple seats” in the middle, the dividing partition did NOT go down which was really annoying (for many in the cabin). The shoulder area is definitely tighter than on the 777-300. The dividing partitions are designed to go down, but they must be having issues with them because they were bolted in the up position throughout the cabin. Just be aware if you are traveling as a couple. You might as well get the window seats. The only advantage I can think of for the forward-facing seats is that when the tray table is out, you can still escape by dropping the aisle-side armrest and sliding out sideways. The downside of the extra side table is that you can’t do that with the rear-facing seats; when the tray table is out you are really boxed in. If I remember correctly, a another cool thing with the IFE system on 772 retrofit compared to 787 is the separate screens – you can watch movies on the large monitor and displaying the airshow on the remote control screen, or vice versa. I have flights on two of these planes this summer to and from Europe. At least that’s what the AA seat map shows. I was originally booked in F before a plane swap to the new 772 configuration. Do you think I should be worried about another equipment swap? I haven’t called to get my miles refunded because I’m afraid of another swap into a crappy J product. The legroom is really lacking compared to the B77W. VERY noticeable as a 6’4″ on a long-haul flight. In all regards, it’s several inches shorter and it’s noticeable. Flew the B788 (forward window on NRT-ORD), B772 (backwards window on JFK-GIG) and B772 (forward window on GIG-JFK). Backwards-facing is tighter in the shoulders, but more side tables and cool view (as you said). @ lucky I hope you have a chance to fly it long haul soon! Interesting that there are 3 different touch screens for the seat, they are turning into Emirates! Sorry @ lucky for asking so many questions, there is just not a ton of info on this product due to not many aircraft having it, last question, how do you raise/lower the partition? I loved this product, especially the rear facing, window seats. They’re superb when flying alone. However, I’ve found that the partitions between the middle seats do not go down — though they have tracks and look as though they should — a discovery which was echoed by the FAs on the flights I took on this aircraft. That was disheartening on the trip I took with my wife; she’s smart and funny, and I look forward to just relaxing and talking with her on a long flight. For forward facing center seats, the partition is permanently down and permanently up for backward facing center seats. Really odd they did this as the partitions do look like they should be movable. There’s a lengthy FlyerTalk thread about which rows have seats that are not connected. I will try both the 777-300ER (DFW-HKG) and 787 (PEK-ORD) in April so I look forward to comparing them with only 10 days or so between flights. I’m 6’2 and when I flew from DFW- Beijing on the B787 I was in 4A and noticed the tightness when the seat was in Flat mode. One thing I noticed about the seat itself was the difficulty of adjusting the seat. Depending on the customized position you had the seat it in, you weren’t able to move. I agree wholeheartedly about everyone’s comments about the side table, nice to have all the storage space. On the way back I was seated in 7D and noticed the narrowness of the seat as a whole and wished I had more storage space like in 4A. 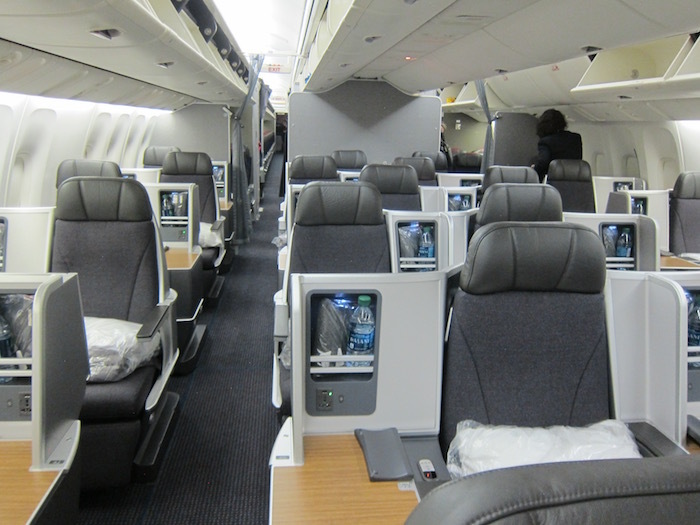 I just glee on an American Airlines 788 from LAX – GRU (departed 2/28, landed 2/29). I’m 6’2″ and immediately noticed the difference in this hard product from a 777-300ER. The tightness in shoulders and lack of legroom was the first and most apparent difference. What also really bugged me was the lack of easily accessible storage areas. Yes, there is a compartment behind you, but the “counter space” doesn’t make up for this. Also there is an extreme lack of privacy. I was in 6L (rear-facing) and looking at my neighbors + the entire economy section the whole flight. And there was also a LOT of business class lav usage by economy pax. LOTS. I’ve already flown international J multiple times on the 77W, the 788, the refurbished 772, the refurbished 763, and the 333. What do I win? 1) I like the rear-facing window seats because my head is closer to the window. In the aisle seats, I have to lean forward for a better view, while in a rear-facing seat i can just glance out the window effortlessly. 2) Rear-facing seat has the entire table/partition from the aisle which is great for table-top real estate and privacy. This partition however, does make it more likely that you have to adjust the seat to get out. On the 773ER seats, you can just lower the armrest and step out. 3) Some rear-facing seats (like 2L) tend to face the person opposite the aisle– while they are angled away at you, you have about a 30 degree line-of-sight to them. 4) These seats don’t have as much storage space to stash all your small items as those on 773ER. I had to leave stuff on the desktop, risk it dropping between the seat/table, or have to keep getting up to retrieve items from the overhead bin. 5) The ottoman is small; when i tried to stash my pillow/duvet there, it always seemed to fall off. 6) There is no easily accessible storage cubby for shoes; if I stored them under the ottoman, then I found myself having to move the seat to retrieve them. 7) For some reason, flight crew never had me stow screen in this seat. May be coincidence or that the seat doesn’t interfere with egress from the seat in the deployed position. On 773ER, the screen has always been required to be stowed for for taxi-takeoff-landing. (I did notice that the little green light on the seat number plaque that indicates the seat is in proper takeoff position is illuminated even when the screen is deployed). 8) The narrower shoulder width I did not find noticeable. I am only 5’10, so for taller person, this could be a problem. I experienced only one significant problem with this seat: On my return flight to DFW, as Lucky mentioned above, I noticed that anytime the passenger in the seat behind mine moved, I could feel my seat move. I don’t know what is linked in the seat frame, bracing, or motors, but I could feel my seat shake every time he made a move. I asked the FA if she needed to file a work order for the seat and was told that “all of these new seats are having these problems after a while.” She suggested in the future I select one of the seats that didn’t back up to another. Only had this problem once, with n of 2, but I have never had this issue with the 773ER seats. Flew them to/from EZE – I felt that the rear facing seat was a bit more comfortable for a taller individual, I’m 6’1. I also think the most “private”seat is 1D – with no one staring at you. The dividers for the center seats are not designed to go down to the dismay of the couple choosing those seats. The seat controls are easy enough to use. I did find that turning into the bed position was easier while off it – as I had to constantly readjust myself when I stayed seated while converting into the flat position. With the IFE I found it interesting that the seat to seat chat was not available but it is available on the 77W IFE…strange. Overall, the 77W seats are markedly better and more comfortable hands down. I also find the 787 to be tight and difficult to get out of the seat since the leg room is towards the window with the forward facing seat. I personally don’t like rear facing seats. AA really should have worked a deal to keep the 77W seating configuration. Having the reverse herringbone on all 777/787 would have made aircraft swaps much easier. Last month I had a swap from LHR-DFW from a 77W to an old 772 configuration. Really bad. I’ve read the whole debate on flyertalk and went with 1H for my 788 flight in May. The seat bumping issue seems to be a real problem and I don’t fancy the extra buckle from the chest strap in the forward facing seat bugging me in what already seems to be quite a narrow seat… I’ll be on a 777-300er on the way back and choosing a seat on that flight seemed a lot easier… I’m kind of surprised you prefer this seat over the reverse herringbone but I’ll try them for myself soon enough. 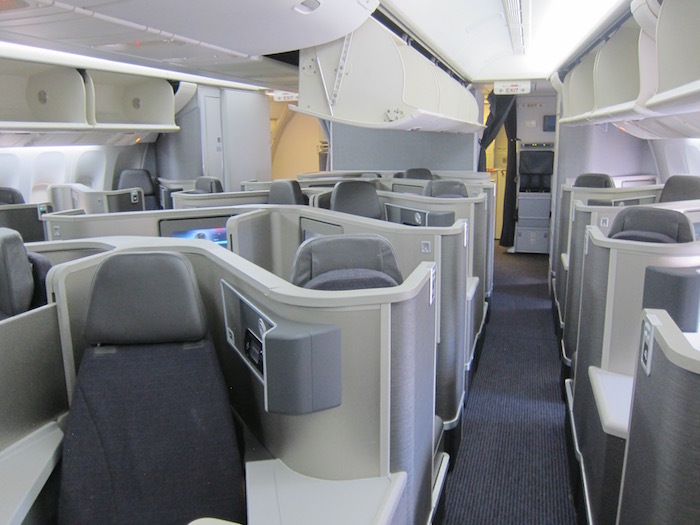 Of AA’s 772’s, what % are converted to have lie-flat business class? Do they have some sort of progress tracker like UA had back in the 2000’s when they converted to lie-flat seats? Looks like from ORD, most, if not all 772’s are still the old configuration. In bed mode, the 77W seat crushes the 772/787 in terms of space. I’m 6’1″ and can fully stretch on the 77W; on the 772, my feet were pressing the wall. I’m also a stomach sleeper so I appreciate width; the 77W seat is also wider. AA should have just paid a few bucks to CX; they’d have had a much better seat, and the fleet would probably be close to being done by now. I have yet to fly the 777-200. I have flown the 788 and the 77W. I think the hard products on these planes are best for people 6′ and under. I stand 6’3″ and 225 lbs. I am cramped and my shoulders are squeezed. The only way I can comfortably sleep is on my side. IFE is great on all of these planes. In the end, I hope they use a seat similar to the Turkish 777-300 seat. Great seat, spacious too. Being booked on the ‘new’ 772, can anyone tell me which two seats are connected together? Is the rear-facing seat 3A connected with 2A or 4A? Thanks! If you are a couple traveling together, be aware of this comment from Clint, my wife and I had the same issue…very annoying: Though seated in the (rear facing) “couple seats” in the middle, the dividing partition did NOT go down which was really annoying (for many in the cabin). The dividing partitions are designed to go down, but they must be having issues with them because they were bolted in the up position throughout the cabin. Just be aware if you are traveling as a couple.’ Just FYI, the forward facing seats did not have this issue…but you did have to move the seat forward to chat. So is the verdict for couples then forward facing middle? Does the seat move up enough to where you feel together during meal service or to have a conversation? @James, I just flew these new seats twice a few weeks ago with my wife. I don’t really think either forward or backward makes a difference for being able to have a conversation with your travel companion. Neither ones really allow for much conversation without some awkward movements. I would still probably go with a middle pair if with a companion, and a window by myself. This is ridiculous. Whatever engineer designed this should be fired. I’m on this plane right now and there are three couples all sitting together. None of which can talk to each other on a ten hour flight. So much for two 8k tickets. 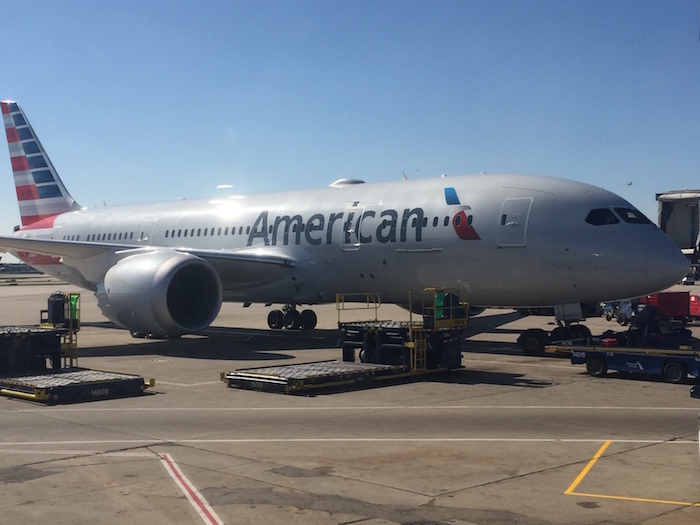 My wife and I flew AA 135 LHR to LAX on October 30 this year (following AA 108 LAX to LHR on the 777-300). Surprised to find that the originally scheduled (and personal favorite) 777-300 had been changed to a refurbished 777-200. My wife sat in 7A (first rear facing seat in the aft business class cabin) and I had seat 8A (first forward facing seat in the same cabin). First comments from my wife were that the seat seemed smaller overall as compared to the 777-300 (she is a petite 5’2″) and not as private (as she could clearly see the passenger across the aisle). Also she had only one window at her seat which was located behind her head. My first impression was that my seat was smaller and definitely did not have much storage for small items. I thought my wife’s seat looked claustrophobic because of the fixed table on each side of the seat; as compared to my seat with the familiar adjustable arm rest on the aisle side which I tend to leave down for a more open feel. I too could see the passenger opposite me but soon forgot they were there. My seat was as comfortable as that in the 777-300 and I slept for much of the 10.5 hour flight. Didn’t experience the annoying seat jostling issue reported by other reviewers. The crew said this was there first flight on the 777-200 and they preferred working aboard the 777-300. If I travel with my husband and 3year old kid & one 10 month baby on 772, could you suggest how to select seats? As I saw someone said, Some rear-facing seats (like 2L) tend to face the person opposite the aisle,~~yes, I want it, let my 3 year old kid to see me! so I should select 2 L & 1L and 2H?